The horse has a natural pulley system in its leg. It uses the bone pivot of its fetlock and lower pastern, along with the help of its ligaments to take the brunt of its landing. The hoof itself can expand in the heels and the digital cushion helps soften the blow within the foot. A fun fact to keep in mind: The lower limb has no muscles. None. It has ligaments and tendons, yes, but no muscles. The tendons are connecting muscle to bone. It comes from a Greek word, teinein, to stretch. Ligaments are attaching bone to bone. It comes from a Latin word ligare, to bind. You can stretch muscles and tendons. Athletes will stretch after a workout, when their muscles and tendons are very warmed up. You cannot stretch ligaments. They are made to hold joints together and bones in place. You will not do stretches to help your suspensory ligament in a horse’s limb. You can do stretches to help relax their tendons. The muscles up the upper limbs and shoulders pull, like puppet strings, the lower limb tendons. They either flex or extend. 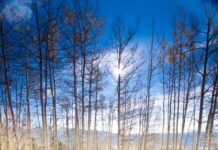 Extending is reaching, like claws reaching out. Flexing is contracting, digging, like claws into your jeans. If you’ve ever watched an adult cat that still thinks it’s nursing, it will extend and flex its claws over and over. This is what the flexor and extensor tendons are doing in the hoof. They are rotating and releasing the angle of the hoof so that it can land, then dig in and push off. It’s like a cat claw. Every joint has a center of rotation or range of rotation that best works for it, based on the supporting ligaments, tendons and muscles around it. The hoof also has a range of motion that it would like to follow. 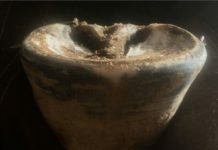 The coffin bone is hinged against the lower pastern bone. Imagine the ball of your foot (the big pad) and your big toe. Lift up and push down with your big toe. You are extending and flexing, just like the coffin bone in relation to the short pastern bone. Test your range of motion UP from flat on the ground. You have a no barriers to lifting in what could be viewed as “the full range of motion” of that joint. It’s a bit like a pendulum. 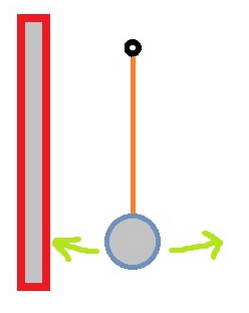 Given the right amount of push, it can freely swing from left, to center, to right and back again. Given its position, you have an expected range of motion. Now let’s adjust your limb, into a high heel shoe position and ask the same exercise to be done. 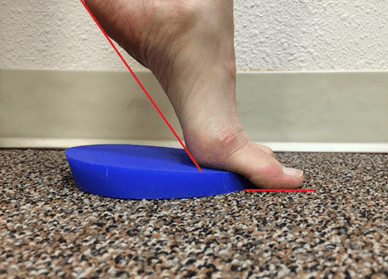 With the ankle lifted, you have cut down your range of motion for that joint. 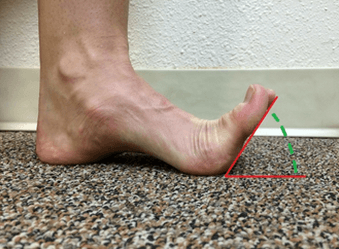 The tendons that lift your toe are already in a rotated, lifting angle, by the mere fact of your heel being elevated. You can’t change one part of your foot and expect it not to affect the other parts. Not only can it not swing widely towards the wall, it will no longer build the momentum to gain full range on its “open” side either. Forgive my Crayola art; this is as good as it’s getting. What we have here (L to R) is a hoof viewed from the side. You have the coffin bone (solid grey) with a groove in the back that the short pastern bone pivots against (grey outlined). You have a red tendon, that is connected to the top of the coffin bone and lifts it, angling it up. 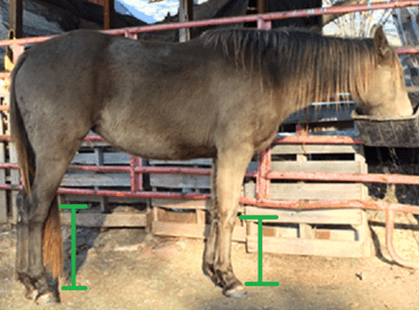 You have a green tendon that wraps under the bottom of the short pastern bone and attaches to the coffin bone which pulls it and angles it down. There are other pieces in the hoof, but I’m trying to just illustrate the action of these two tendons. When one is pulling with a force of “3” the other is releasing with a force of “3”. It’s a push-me-pull-you device. Flip and flop. So when the hoof is digging into the ground, the tip is pulled down by puppet string GREEN. RED must relax and release to allow it to tip down. When the hoof is landing heel first in the stride, the GREEN must let go and the RED pulls. These are your extensor (RED = to extend) and flexor (GREEN = flex, contract, grip) tendons. Ideally, the hoof should be balanced on its center of rotation, or its pivot point. If you’ve walked with flippers at the beach, you know how tired your legs get with having to lift those flipper toes (and sand) with each step. You can also get tired in high heels, where your center of rotation is balanced on a stem and the room for pivot is very tiny, front to back. How many models try striding down the runway like nothing is wrong and then their ankle wobbles and they go sprawling? You don’t want too much toe out front or too little toe out front, it affects how hard the tendons have to work to keep you mobile. Let’s look into a hoof to see where our center is. 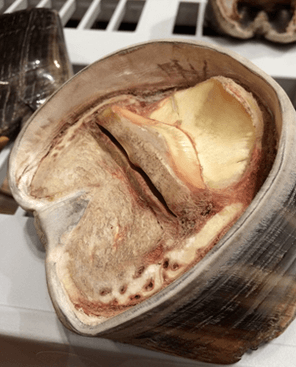 Here is a hoof capsule that was freeze dried with the coffin bone and digital cushion still in place. You can see the deep dish where the short pastern bone would groove into and have a half-pipe ramp to drop into. See that slit? That’s where the band of your Deep Digital Flexor Tendon goes. It attaches into the belly of the coffin bone. If we had the short pastern bone in place, we would be able to see the center of rotation. But I’m all about spoilers, so let me guesstimate it in green. I tried to visually follow where my halfpipe was as I turned the hoof to a profile view. I then dropped my green circle to the bottom of the hoof to see if we possibly had a 50-50 of mass in front of and behind our center of rotation. What you can’t see (SORRY!) is that the heels were long and would’ve been trimmed. The honest back of the hoof, where the frog and bars and hoofwall all would have met up nicely, was where I dragged my red line. As a rough look: yes, it would be a decently balanced hoof, 50-50 to not put undue strain on either the Extensor Tendon or the Flexor Tendon. What would happen if the toe was longer? I carried over my same center of rotation, but this time, added in a longer, sloping hoof. Now we clearly see there is a lot out front and not a lot in back. The Extensor Tendon is going to have to LIFT that massive schnoz up in every stride (against the friction of sand, mud, turf, water or other variety of footing) and the Flexor Tendon is going to have to PULL that massive shovel down into the terrain in every foot fall. Not easy on either of those tendons! And not only do we have those two tendons affected by our trim (or what hoof we take away or leave in place) we have the suspensory ligament and the conformation of the rest of the limb to consider. Here is the range of motion in my ankle. From a starting point, I have the ability to spring up and down quite a bit. But what if my heel was stuck in the middle position? I would only have half the rotation available to me. What if my heel was stuck in the far right position? I would have my leg column stacked vertically with no shock absorption left in my leg structure. Additionally, my pivot point is now balanced on the ball of my foot and I will have a harder time balancing there. My knees and hips and lower back will try to take up the support roles for shock absorption. This is the primary factor as to why I never became a Flamenco dancer. That and I couldn’t dance…or wear frilly red dresses. What about negative angles? Just like a long toe, the negative slope of the foot pulls on the suspending ligaments and tendons in my leg into a state of constant pressure. This is how my ankles feel worked after riding with “heels down” at a trot for extended periods of time. I actually ride with my heel “flat” or at a neutral level, because I could care less about my form and a whole lot more about my Achilles Tendon not snapping off. Like a horse with a negative Palmar angle (coffin bone base pointing up at the tip and falling at the back) the supporting tendons and ligaments are in a constant frame of tension. 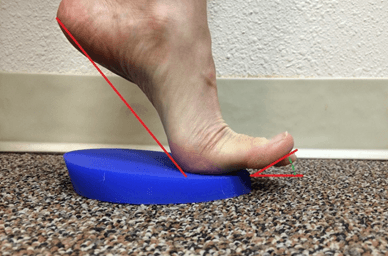 Again, just like a long toe, it gives a lot of work to the Flexor tendon to not only come up from being negative, but to rotate up to flat, then to dig in when covering ground at any speed. 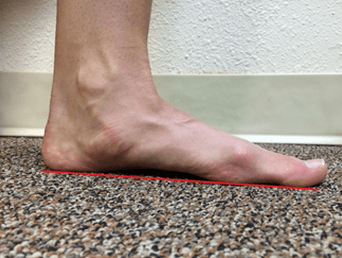 Barring an incident that actually tears or sprains your tendon, you can have inflammation and damage due to repetitive or prolonged (even at low energy) activities and also from standing in the same position for long periods of time. It wasn’t real to me that horses could be injured just standing, until I thought of their feet. Just like me in high heels, I will get sore legs just standing in them. And when I ride with my heels down, in a negative palmar angle? I get sore then too. 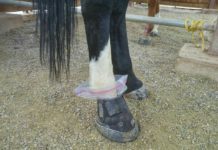 It’s food for thought: if you are plagued by lower limb injuries or inflammation consider the quality of your hoof work and make sure your horse is not left with overly upright or overly sloping hooves. Next articleAnd You Thought Booting a Horse was a Tough!